This simple little fake email just showed up claiming to have deposited some money in my checking account. It was sent to the email address registered to the domain, so they are scraping that. The report spam email address is different than the from and is a dead or hacked domain…same with the unsubscribe link. The Claim Your Payment link is a shortened link using Bit.ly. I’m glad to see Bit.ly is stepping up protection. 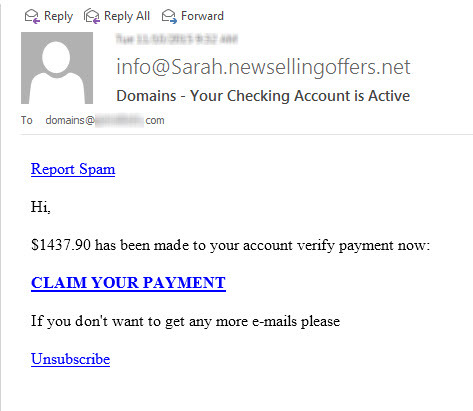 So, that is nice, and you can see that this wasn’t really a malicious link, just a link to a BS offer.